Attractive and cost effective, decorative concrete is creating a combination of textures, patterns, colors and sealers. From subtle effects to distinctive patterns, your options are virtually unlimited. Our concrete artisans are able to create the look and feel you are looking for- from simple to elaborate, concrete can be textured to resemble the look and feel of fine Venetian plaster to rough cobblestones. The addition of color adds a deep and complex dimension to your decorative concrete and once sealed, your concrete will be enhanced and protected for years to come, with the sheen desired. With multiple uses including pool decks and patios, driveways, outdoor kitchen counter tops and more, consult our design professionals to explore the potential of this versatile material. 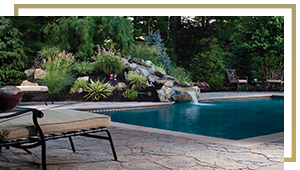 We are IVY Studio, a landscape design and build consulting firm based in the greater Boston area. We design and install residential outdoor environments and look forward to starting a dialog with you on your outdoor expansion plans. Contact us at 781-591-0300 or vern@ivystudioMA.com.